EDIT: well, now, I'm on page 464. I was noticing that too. I didn't notice that, but on other forums where I have been a moderator, I have seen it happen due to deleted, or hidden posted pushing posts onto a further page. Since we aren't able to see them though, from our point of view there's nothing there, and we can't access it. I don't know if that's what is happening here though. Last edited by Dad_Scaper; January 10th, 2018 at 04:02 PM. Back on topic, Rushing Shield looks really fun, and swingy, which gives a good reason to use this guy over Isamu. Isamu can survive, but this guy can kill. I like the theme and power set for Johann, and I'm interested to see how well he plays. to review. I'm not really a fan of X reveal powers in general (except for when it's granting extra turns), especially something this minor. Doesn't seem like there's any reason this couldn't have just been a once per round power sans X. That's mostly a personal complaint though, so unenthusiastic to review Johann I guess. Johann Graybeard has received 4 Yea votes to review (Scytale, superfrog, BiggaBullfrog, and Soundwarp SG-1) and moves forward in the process. I appreciate the judges' reviews and the additional comments. After being mentioned in the first master set, the Durgeth finally made it onto the table. Uzog wants to come join the cool kids too, but does he have what it takes? When comparing with similarly-priced heroes, Uzog seems tougher than most. He beats Thorgrim and Finn easily. Crixus has similar stats and probably is better alone, but Uzog has cheerleader bonuses that he adds to his bonding squad. Probably the most telling comparison balance-wise is Pel, who is 10 points more and works with similar (and same) squads. Uzog and Pel sport the same stats except for attack (Uzog has 5 and Pel has 6). Pel’s strong stats are inhibited by his two negative powers, but Uzog’s cheerleader bonuses only have a small drawback (not being able to move for a round). His bonus also doesn’t just help him, but other Durgeth. This makes Uzog equal to if not better than Pel as a standalone hero, and a strictly better option for the Ravagers in any situation. However, he does that for fewer points, which is concerning. A giant Durgeth headhunter is really cool, and Uzog sells it well. The mini is certainly intimidating enough, and the stats of a Menacing Savage fit the mini and the theme. The powers are also in line. Being a Durgeth is somewhat new ground, since he’s larger than the ones released, but having some of the species be bigger and badder than the others isn’t uncommon in fantasy, and Uzog certainly looks … unusual … enough to sell it. We’ve seen powers that use markers to make units stronger, and we’ve seen cheerleader powers, but this is the first time we’ve seen them combined, and I like it. It makes Uzog feel and play like a sharky cheerleader, which is a unique take on a bonding figure, and it meshes well with the Durgeth play style. On his own, Uzog is a pretty decent beat stick. 5 Attack hurts a lot of figures, and if he can get some Skull Markers going, he’s going to be able to take down most figures pretty quickly. But of course where he really shines is with his buddies, the Durgeth Ravagers. Uzog is a really, really good bonding option for the Durgeth. He’s cheap, has a powerful attack, is beefy enough to take some hits if the Ravagers can’t get their bonding going, and once he gets even just one Skull Marker on his card he makes their attacks, and thus their bonding, that much better. Not many units in the game can take a lot of hits from the 4 and 5 attack of Ravagers and Uzog, and fewer still can do so while they have minus 1 or 2 defense. Uzog doesn’t help the Ravagers with their weaknesses (ranged commons, special attackers, non-swamp maps), and that’s fine. What he does do is further enhance and define their play-style — basically being aggressive and killing stuff fast enough to roll over the opponent. He fits really well in an army so aggressive and feels like a natural leader. But he also feels too strong in his role. The power that Uzog offers is supposed to be held in check by his not being able to move during the round after he takes a skull. However, since you can choose when and where that happens, it’s not a very tight restriction. 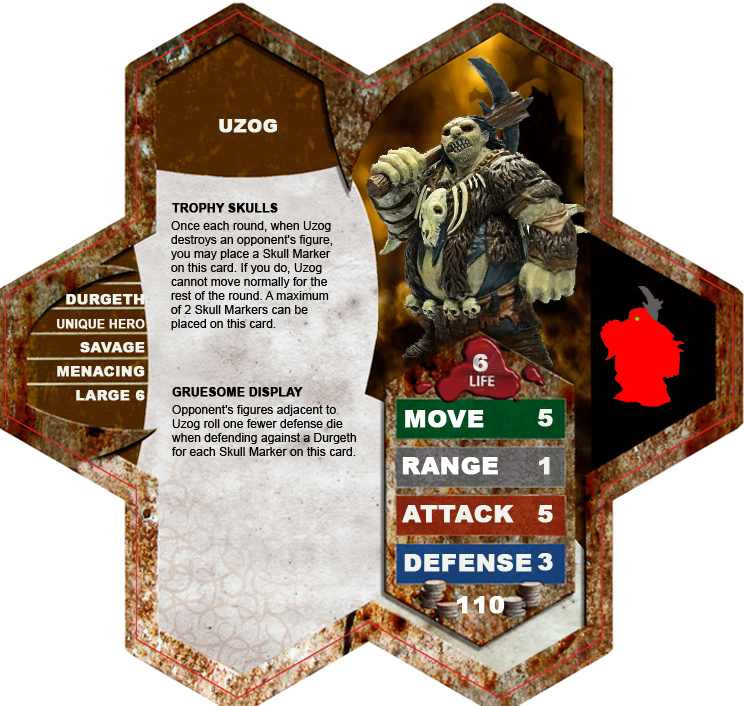 Usually you just wait for the end of a round (or take a turn with Pel/Zombie Hulk in a larger point game), but even if your opponent does get to take advantage of Uzog’s immobility, he’s usually tough enough to take some hits. This makes him a constant threat when he’s on the frontlines. Your opponent has to worry about both his passive aura and his active attack of 5, and juggle that with the threat of how many Ravagers are around. It makes playing against the Durgeth a balancing act that is strategically intriguing. But it’s a really big impact on the game for only 85 points, more so than other bonding heroes at his point range. Those who have similar offensive potential (Pel, Crixus) don’t have the cheerleader effects, and those with cheerleader effects (Thorgrim, Finn) don’t have that kind of power. I love Uzog. I love his theme. I love what he does for the Durgeth Ravagers and what he adds to the faction. He is the leader they should have. However, right now he just feels like he’s giving too much for his point cost. Not that he’ll reimagine any competitive metas - the situational/swingy nature of the Ravagers holds him back there. But the more I played with him, the more his price tag felt too low for what he offers. I vote Nay to induct Uzog into the Soldiers of Valhalla. Uzog by @Kinseth has received 2 Nay votes to induct (Scytale and BiggaBullfrog) and is removed from the process. I'd like to submit Uzog (once again). After careful considerations, reviewing of playtesting logs & reports & the findings of the SOV judges that the previous version at 85 was too aggressive in nature in pricing. I had been revisiting price and gathering data on this in anticipation of him failing after having one down vote by a judge. Uzog is a blast to play, and he is a welcome addition to the Durgeth Ravagers. I would not be re-submitting if it were other issues(Other than Cost), that ultimately saw him rejected by SOV.